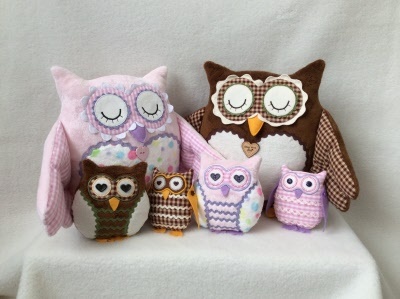 These beautiful owl family have been designed by Gail Penberthy and are a joy to make and own. Gail has made them out of a soft fabric called Cuddle but they could also be made out of fleece or fabric. The pattern includes instructions and templates for all three owls. They measure 9, 4 1/2 and 3 inches tall.